Winnaar van de Muziekband prijsvraag en de mini-prijsvraag 8.0! Foil (premium) lid t/m 13-1-2037! Hoe zit een beurt in elkaar? 2: Op de stack leggen (Let op, nog NIET gecast dus je kan hem nog NIET aanwijzen als target!). 9: De spell/ability werkelijk behandelen als 'gecast' of 'gespeeld'. Subtypes zijn verdeeld per type. Instant en sorcery delen een lijst (die bestaat uit Trap en Arcane). Artifact heeft z'n eigen lijst (Equipment), Land heeft een eigen lijst (Urza's, Desert, Swamp, Island, etc), Planeswalker een eigen lijst (Liliana, Bolas, etc), Enchantment een eigen lijst (Shrine, Aura) en Creature en Tribal delen een lijst (alle creaturetypes, zoals Goblin, Merfolk, Fish, etc). Beginnen met 'When' , 'Whenever' of 'At'. Jan (3x) 2e x in 1 dag binnen - vanuit België! 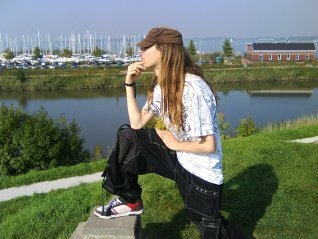 Hallo allemaal, ik ben Crucifix (echte naam: Loek, ook wel bekend als Crusifix omdat ik het ooit verkeerd heb gespeld), 20 jaar oud! Ik ben al ongeveer twee jaar columnwriter hier op Nedermagic en Official Rules Advisor. Naast school heb ik doordeweeks ook nog werk, dus je zult meer van me horen in het weekend. Echter, dat neemt niet weg dat ik graag 's ochtends nog even mijn berichten e.d. check! Voel je dus vrij om een vraag, voorstel voor een column of iets anders te messagen! Ik heb ADD waardoor ik soms dingen door elkaar haal. Helaas, ik kan het niet veranderen. Als ik snel ergens reageer, dan is het uit een impuls. Het kan dus zijn dat ik een foutje maak! Echter, over het algemeen let ik daar op, dus ik probeer die kansen zo klein mogelijk te houden. Bedankt voor je begrip! Geintresseerd in wat ik allemaal schrijf/geschreven heb? Klik op de link hieronder om al mijn columns te vinden! De officiële KvdD, SvdW en CvsC-Catalogus! 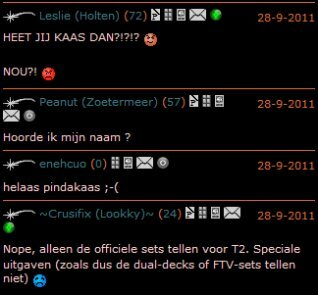 Al mijn decks zijn op multiplayer gefocust. Tips worden altijd gewaardeerd! : Back from the dead for another round of multiplayer! The big story of the Honolulu Pro Tour wasn't Kazuya Mitamura's $40,000 victory in the finals. The big story happened in the first round, where a young boy known only as Hans did something that is causing many to call him a hero. Hans's game was looking unwinnable. He had a negative life total and was kept alive only by his Platinum Angel. 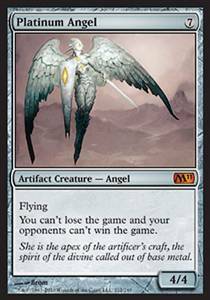 His opponent had just cast a Molder Slug, threatening to remove the Angel — Hans's only artifact — at the beginning of his next turn. But when it got to that next turn, Hans would say a word that would put the whole series of events in motion. A word that would send ripples throughout Magic history. A word that would cement Hans's legendary status. Hans stared at his opponent and said, "No." His opponent was taken aback. "Judge!" said the opponent. "He's refusing to follow my Molder Slug's triggered ability." The judge said, "I have to issue you a game loss, Hans." Hans pointed to his Platinum Angel. "I can't lose the game," he said. And with that, he proceeded to his draw step, undaunted by the judge's ruling. Then he skimmed through his deck for marked cards and put those into his hand as well. "You're violating multiple game rules," said the judge, "in addition to ignoring my ruling, and I am issuing a game loss to you." Hans, his finger still stuck to the Platinum Angel, like a modern day Little Dutch Boy with his finger plugging the leak in the dike, said, "You can issue all the game losses you want, but with my Platinum Angel in play, they have no effect." Hans proceded to the attack phase and swung for 4 with his Angel. He then looked at his opponent's face-down morphs, referred to outside notes, and substituted cards from his sideboard. It was when Hans cast a Demonic Attorney that the head judge was called over. "Ante cards are banned," the head judge said. "That's a complete violation of the rules." But when he saw Hans's Platinum Angel in play, he was quieted. He knew he was defeated. Hans said, "Since the Demonic Attorney's in the game, we have to do what it says." He proceeded to put the top card of his opponent's deck into his trade binder. The head judge frowned in disapproval. "He's right." It was a matter of hours before Hans owned his opponent's entire deck, as well many other cards from his opponent's collection, thanks to a Mindslaver and Ring of Ma'rûf. Each time judges tried to issue Hans a game loss for casting cards without mana, or playing cards in his graveyard, Hans merely pointed to his Platinum Angel. The cards Hans didn't want to take from his opponent he tore up, due to interactions involving Chaos Confetti, March of the Machines, and Cytoshape. Having by this time gathered quite a crowd, Hans produced a folded and wrinkled copy of the DCI Infraction Procedure Guide from his pocket and began skimming it for ideas. He noticed that kicking an opponent's chair out from under them was listed under "Unsportsmanlike Conduct," so he did just that. He also kicked the chairs out from under several other nearby players and spectators. The sun was starting to set. The judges had not even attempted to give Hans a game loss for stalling. One by one, they had hanged their heads and walked away, resigned to their powerlessness in the face of the Platinum Angel. Then one of them hatched a plan. "I know who we can call," the judge exclaimed. The next morning, Hans was woken by a voice blaring across the room from a police loudspeaker. "Hans," the voice said, "this is your mother. I love you. Please sacrifice your Platinum Angel to the Molder Slug's triggered ability so this can all end." Hans lifted his head, looked around the room, and kicked his opponent's chair out from under him once more. "Hans," his mother said, "we miss you. We just want you to come home." It was Day Four of the standoff when another voice blared across the room. "Hans," the voice said, "this is your fiancé. There are only two more days until our wedding, honey. Don't you still want to get married? You have to end this game now, Hans. Please just sacrifice the Platinum Angel to the Molder Slug. We love you. We're worried about you." Hans's mouth hung open, agape. A tear came to his eye. "Marcia," he said. "I love you too." He looked about him, seemingly aghast at what he had done. "I…" he paused. "I concede." A flurry of applause burst through the room. Judges began high-fiving each other and giving Marcia hugs. "Unfortunately," Hans said, "the concession has no effect since my Platinum Angel is still in play." It was two weeks into the game when the military showed up. "Hans," came a voice from a helicopter. "We have you surrounded. If you do not concede immediately, we will open fire." To this day, a sleeved Platinum Angel remains embedded in Hans's tombstone. Hans may have lost his life that day, but he never lost the game. - Notitie: Bob loyaal throwen!